Hopefully you aren’t tired of all the pizza talk yet. (My husband would say there is no such thing as too much pizza.) I promise we are almost done. I shared my tips for making pizza on a budget and my recipe for crust and tips for making the perfect pizza already. 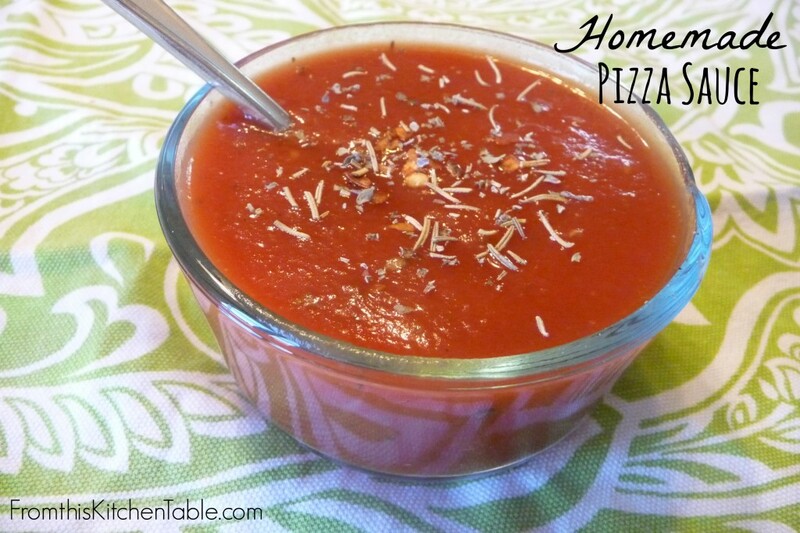 Today, I’m going to give you my easy pizza sauce recipe. Let me tell you a secret. 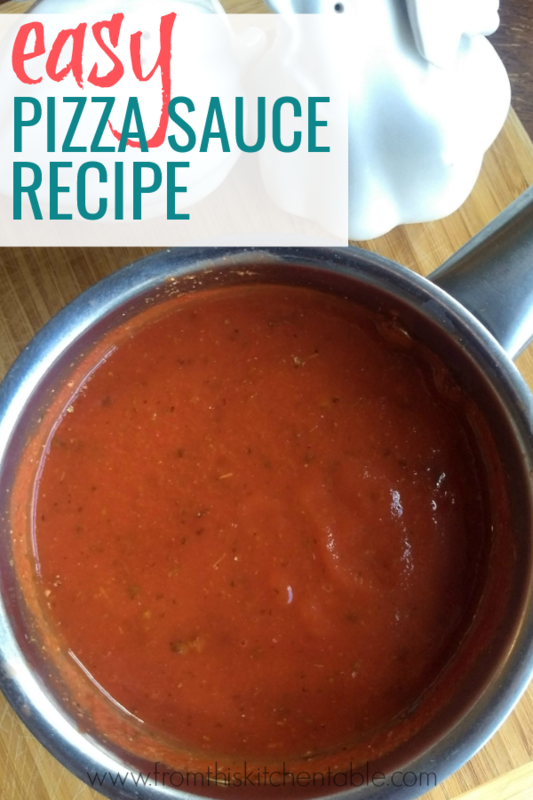 Pizza sauce is one of the easiest things to make and can be done in seconds. There is no need to purchase jarred sauce if you have basic spices in your pantry. I use tomato sauce. If you are out, tomato puree or another tomato based product would work. Pizza sauce is one of those things I never measure ingredients on. I add a shake of this and a shake of that. The past few times I’ve made it, I’ve pulled out the measuring spoons to get this recipe. Feel free to switch it up and taste and adjust at the end. Sometimes I’ll add thyme and in the summer when I have fresh herbs I love to add them instead of dried ones. 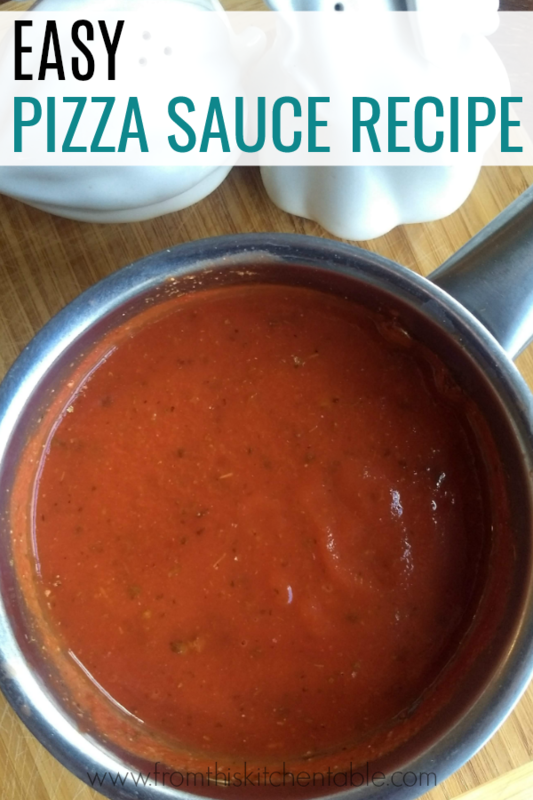 I will make this easy pizza sauce recipe on Fridays with two 8 ounce cans of sauce and use half of it for two pizzas and then save the other half in the fridge to make pizza again the next week. Combine everything in a small saucepan and gently heat on low to let the flavors combine. I use approximately ½ cup per pizza. This recipe makes enough for three or 4 pizzas. Freeze in pizza size portions if you aren't going to use it all. 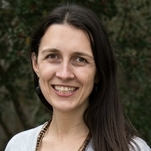 This entry was posted in Main Dish, Recipes, Uncategorized on March 20, 2014 by Deanna Michaels. Me too! Quick and easy recipes are the best! Pizza sauce is so easy. Definitely worth making at home. Deanna! Love this Recipe and love making Homemade Pizza! Great Inspiration! Would love to Feature your Recipe in our Pizza Party over the weekend on Food is Love Recipes! Thanks, Laurie! Homemade pizza is so good – nothing quite like it. Thanks for stopping by. Pinned. We make homemade pizza at least once or twice every month. Good recipe to have on hand. Thanks so much for pinning and stopping by! We love homemade pizza in our house too. It’s sooo good! Looks great! I’m pinning this to my natural health board 🙂 Thanks so much for sharing.. Thanks for your comment and for pinning! It’s a super easy and customizable recipe. Hope you enjoy it. Homemade sauce is so easy! Hope that you find a recipe you love. Thanks for stopping by! This sounds simple and delicious. Those are two things that I really appreciate in a recipe! I would have never thought to add marjoram or fennel seeds. I’ll have to try this out! Simple and delicious are the best kind-of recipes. Some people can’t stand fennel seeds, but I enjoy the extra flavor they give. My husband would whole heartedly agree with you! We love pizza in our house. Thanks for commenting. Found you on the Sits Girls Link Up! This looks great! I’m thinking maybe a pizza party after school for our boys today! Definitely going to try this! Thanks! Pizza party sounds like such a fun idea! Hope that you guys enjoy the sauce. Thanks for stopping by. Thanks for sharing, I’ve been looking for a pizza sauce recipe! Thanks for stopping by! It’s such an easy recipe and simple to switch up the spices to taste or what’s on hand. Hope you guys enjoy it.